AUDI currently leads the premium mid-size race - and things are not going to change in a hurry. The new Audi Q5 has been on the receiving end of a minor facelift, but most importantly is now has a range of extra features and four new engines. Best of all, the entry level price remains the same, but Audi estimates its four-cylinder models get about $6500 worth of extra gear, while the six-cylinder variants have an additional $7000 in standard equipment (for a rise of $500 in the diesel and $1100 for the petrol). Standard kit is much improved across the range, and includes 18-inch alloys, eight airbags, leather trim, 10 speaker stereo, electric tailgate, automatic lights and wipers, floor mats, parking sensors, cruise, tyre pressure monitoring and dual zone air con. The six-cylinder offerings get better leather, three-zone air con, electric memory for the driver's seat which is matched to the key, sat nav and rear view camera. On offer are two diesels, a turbocharged 2.0-litre four-cylinder and a 3.0-litre V6 matched to a seven-speed automatic. The pair of petrols include a 2.0-litre turbocharged four-potter and a supercharged V6 both partnered to an eight-speed self-shifter. 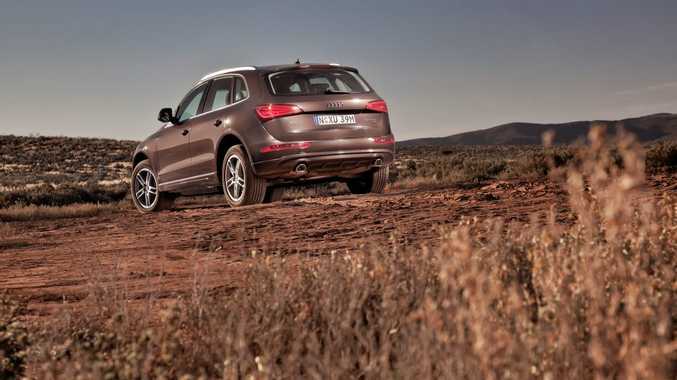 The Q5 has gone from strength to strength as part of the "product improvement" regime - it's not a facelift in Audi speak. Additional standard equipment provides a trump card over the key competitors, with functionality and comfort already in its corner. During a challenging journey from the city to the Outback and on some challenging Flinders Ranges tracks, the Q5 was difficult to fault. It has the ability to step off the bitumen, but few buyers of this luxury SUV will tackle terrain much tougher than gravel. The writer was Audi's guest in South Australia. Details: Five-door all-wheel drive mid-size luxury sports utility vehicle. Engines: 2.0-litre four-cylinder turbo diesel generating maximum power of 130kW @ 4200rpmand peak torque of 380Nm @ 1750-2500rpm; 3.0-litre V6 turbo diesel 180kW @ 4000-4500rpm and 580Nm @ 1400-3250rpm. Transmission: Seven speed dual clutch automatic. Performance: 0-100kmh in 9.0 seconds; 6.5. Top speed 200kmh; 225kmh. Bottom line: $62,200; $75,500 (plus on roads). Engines: 2.0-litre four-cylinder turbocharged petrol generating maximum power of 165kW @ 4500-6200rpm and peak torque of 350Nm @ 1500-4500rpm; 3.0-litre supercharged V6 petrol 200kW @ 4780-6500rpm and 400Nm @ 2500-4780rpm. Performance: 0-100kmh in 7.1 seconds; 5.9. Top speed 222kmh; 234kmh.